Full Itinerary by email or post on request. After a couple of years when blogspot inexplicably shut down we have managed to restart. 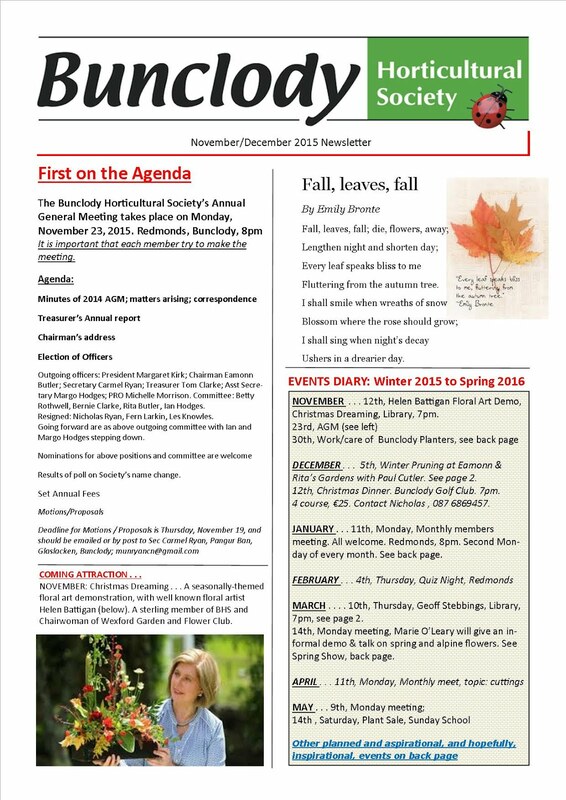 First on the agenda will be the re-entry of earlier newsletters and notices. Please be patient and we promise to keep the information flowing. Our New Year's Newsletter is packed with lots of events - so put them in your diary, and we hope to see you at some of our upcoming events! Thank you all for coming along tonight, the Society’s 65th AGM. 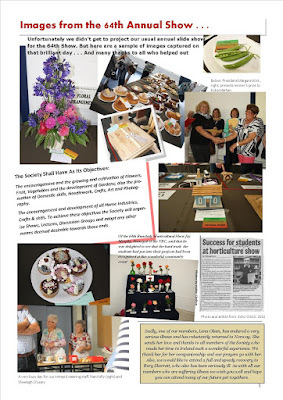 As always, and no change here, I am very grateful to the Society’s officers and committee for making 2015 as successful as it possibly could be. I know this year may not have been as fulfilling insofar as outings had not attracted any great turnout, and especially when a subsidised coach journey was proposed. And, of course, the main one to the National Botanic Gardens and St Anne’s Rose Gardens in Dublin were abandoned due to appalling weather. The holiday to Donegal, which had been very attractively priced, seduced only four members, Bernie and Tom Clarke, Rita and I. I suppose many people associate Donegal with rain and wind, but the three days we were away, I believe, provided some of the best weather of the whole summer. And the gardens we visited were magnificent. But let me say here, that there is no obligation on any member to participate in any outing, talk or project. We all lead busy lives and while those of us who are lucky to have retired, and imagined we would have lots of time on our hands, soon find there really is not enough of time. Anyway, other highlights of the year which were successful were the Quiz Night, and many thanks to Quiz Master Les Knowles for making it a very entertaining night; The Plant Sale again was a tremendous success, and of course the Show, main highlight of the year, was a real turnabout. From literally dust to starlight. The show was amazing, and so many supporters and visitors positively commented on it. If you remember, not many members who had a chance to see the venue under turmoil, believed the show would take place. You just have faith. In a personal role, I have to thank everyone, stewards, helpers, judges, and especially our catering staff, who, let it said, had to work in the worst conditions ever. But, they made a terrific job of it and we all got to enjoy and relax with the best of home cooking. The addition of the plant and bric-a-brac sale added extra interest and proved very popular. And, of course, there was the after Show meal in the Golf Club which helped us to wind down after a hectic week. I am very conscious that none of us are getting any younger, and the hard work of moving furniture is quite an exhausting task, including the time and effort beforehand, on the day of the show and the cleaning up on the following Monday morning. It is not something many of us can continue to participate in. So, we must seek ways to lighten the load and, at least for the day, encourage members of the public to help out. Again many thanks to Jay Murphy and the college management committee for their unconditional support and assistance. In further cross-community cooperation a group of volunteers from the Society engaged with the Tidy Towns and made a really excellent job of planting up the boxes and troughs along the Stream. Another cross-community exercise, which I believe is also proving very valuable and popular, is our close association with Bunclody Library. Most of our talks are now held there. It draws in people from all areas, and is something to build on. It is worth mentioning that prior to our collaboration with the Library all our talks were held in Redmonds and were free, including to members of the public. Following each talk or demonstration we attract new members. But really, in my opinion, it if we are simply encouraging the public to take an interest in gardening, getting to know plants and shrubs, propagation and how to make the most of a vegetable plot, we are performing a very valuable community service. It is an ethos I think we should adopt, that is serving the community in whatever way we can. 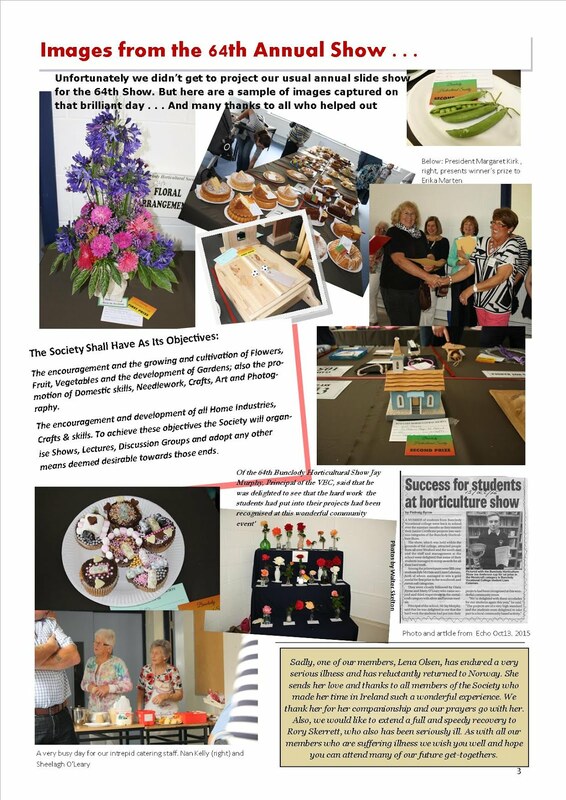 In September, following an earlier Society meeting where an alliance with the 2016 Carlow Garden Festival was proposed and caused some disquiet, to put it mildly, an EGM was held on September 7 to discuss and vote on the concept of moving the Annual Show forward to the Saturday (July 30) of the August Bank Holiday, 2016. This was not well received and voted down. An extra complication which put the final nails in the coffin was the planned VEC extensions perhaps beginning in early summer and not being complete by the August Bank Holiday which would have been the Carlow Garden Festival’s final events. However, a proposal to create an event for the 2016 Bank Holiday to coincide with CGF was supported by the meeting and taken up by your committee. I’m pleased to say that has been accepted by the GFC and we have arranged, on Saturday, July 30, of the August 2016 Bank Holiday, to hold an open day event at Lucy’s Wood, with a noted speaker (to be arranged) to address those attending. 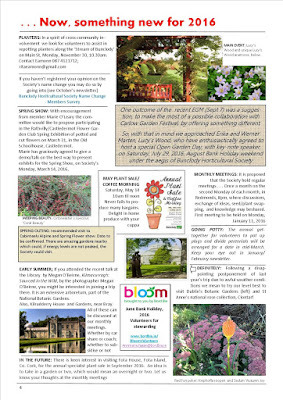 A call will be made to members to help prepare Erika’s and Werner’s garden in the week running up to the open day. More of this later. Although the EGM was called to discuss a single topic relating to the GFC the meeting allowed discussion on changing the name of the Society. This subject did not produce a satisfactory outcome and so a suggestion to run a poll through the October newsletter was mooted. I can say now that the outcome of the poll has been without doubt, voted down (electronic votes 5 for; 14 against; paper poll 18 against. Total number of votes 37). So, that should end the matter and no further discussion will be necessary on the subject of a name change. The year’s calendar of events has not quite finished. We had an excellent and enjoyable Christmas themed floral art demonstration by Helen Battigan, on November 12, to whom we are grateful for giving us her time and speaking so positively of the Bunclody Horticultural Society. 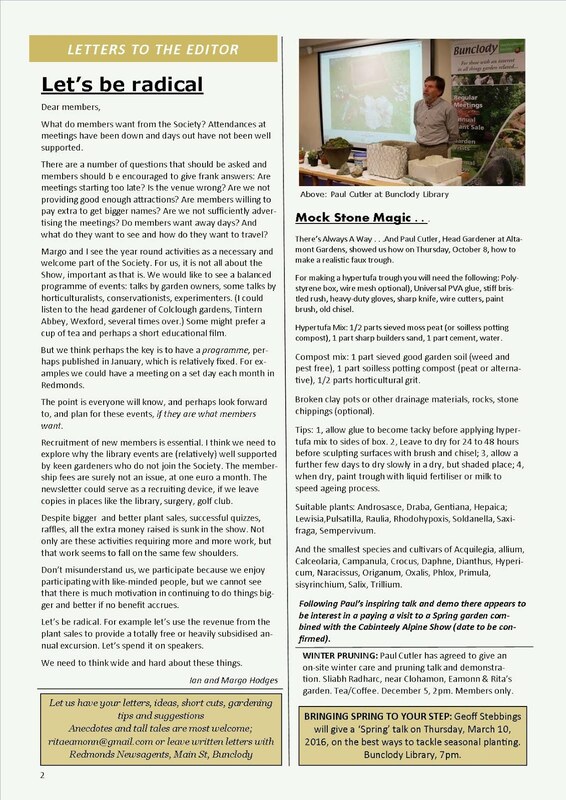 In the previous month we had a most interesting evening with Paul Cutler showing how easy it could be to make faux troughs and produce a real miniature alpine attraction for your patio or garden rockery. This, it is hoped will lead to members participating in the Rathvilly/Castledermot Spring Show. On Saturday, December 12, all members are invited to Rita and my garden at Knockanure where Paul will demonstrate how best to winter prune various trees and shrubs. And don’t worry, nobody will be asked to lift a hand. Our garden will be as you find it. A mess. This will be followed by tea/coffee, and of course Rita and I would be grateful for a few of those very welcome home made cakes. The Annual Christmas Dinner is timed for Saturday, December 12. Nicholas (087 6869457) will fill us in on developments and plans later on. You can see in the latest December/November newsletter that the outgoing committee has drawn up a very active 2016 calendar. Some events are aspirational, like the alpine show and Fota Park. However, it will be up to the incoming committee and the monthly members’ meetings to decide what will run. The Library timetable is fixed, with more to be added, which will be included in the January newsletter, including Colman Byrne on April 7 and Oliver Schurmann, of Mount Venus nursery and garden garden design, May 12. NOVEMBER . . . 12th, Helen Battigan Floral Art Demo, Christmas Dreaming, Library, 7pm. Very successful and fully attended. Many thanks to Helen for a wonderful demo. 23rd, AGM. Best attended in recent years. Updating shortly. 30th, Work/care of Bunclody Planters. Cancelled due to bad weather. DECEMBER . . . 5th, Winter Pruning at Eamonn & Rita’s Gardens with Paul Cutler. 12th, Christmas Dinner. Bunclody Golf Club. 7pm. 4 course, €25. Contact Nicholas , 087 6869457. 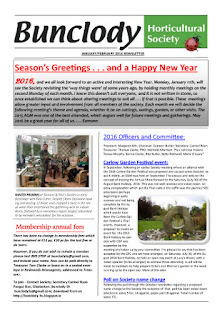 JANUARY, 2016. . . 11th, Monday, Monthly members meeting, second Monday of every month. All welcome. Redmonds, 8pm. 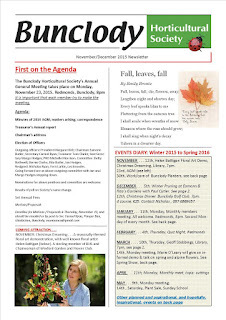 18th, Exciting Annuals, by Rachel Darlington. 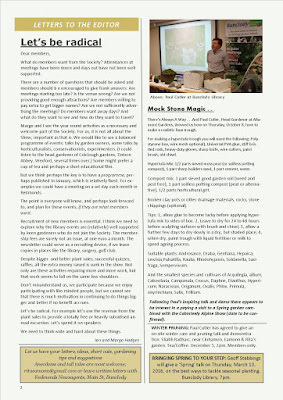 Accompanied by a slide show presentation and hand-outs with a plant list. 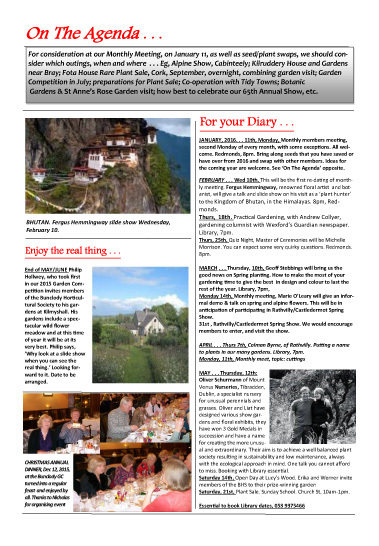 MARCH . . . . 10th, Thursday, Geoff Stebbings, Library, 7pm, see page 2. 14th, Monday meeting, Marie O’Leary will give an informal demo & talk on spring and alpine flowers. 7th, Colman Byrne, of Rathvilly, talk on gardens, Library, 7pm.